You know? I like to learn, I like to share and I like to write, and Internet for this, is the ideal place because you can do all three. With a subdomain and a lot of desire to have fun, I faced very good websites with own domain, convincing many people in IRC to vote me every day and finally I won the contest, to the surprise of many. The Cybercafes boom came, I was working on one for a couple of years and I noticed that there was not a spanish simple web where you could find servers to play, manuals, tricks and even a chat where you could meet other players. 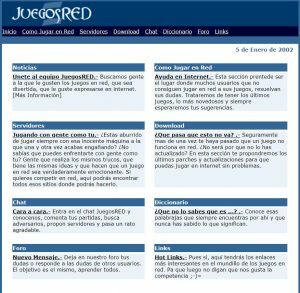 I started to shape this new project and the 5 of January 2002 I launched JuegosRED. This project I could not develop what I would have liked, I started working at full time and it was complicated to make compatible both tasks. As time goes by I got the domain “bernabe.es” where I could share all the information that for a long time I was collecting of the history of my last name. It’s a page that I like especially for its meaning. Later, I got the domain “serpositivo.es” and I was able to share a lot of information about another of my great hobbies, cognitive psychology, NLP and living in positive. Due to circumstances I have not specialized in Web development, but this has not been a problem, because it is becoming easier to make a website and dedicate exclusively to contribute content. I have focused more on managing Linux servers to host webs, analyze social networks and Internet marketing in depth. This is what I do in my limited free time, because I am professionally dedicated to the administration and installation of computers, software distribution in networks and Computer Technical Support. Last week I made an analysis of the visits received in my blogs during the last 7 years and between the three they add something more than 50,000 visits. This is 8000 visits per year, with an average of 20 visits per day. This has done me propose to translate into English the articles with a double objective, analyze how many visits I receive more and continue to learn English, something I need a lot. 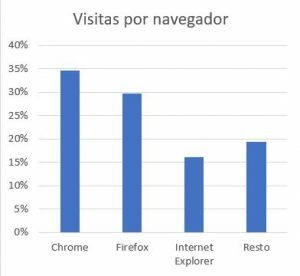 Regarding the browsers used, the king has been Chrome, followed by Firefox. 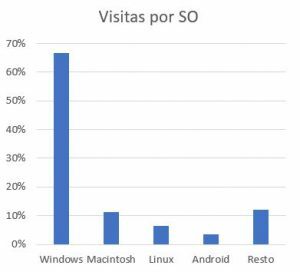 Regarding the Operating Systems, the most used has been Windows, followed by Mac, very from afar. For me the important thing is not any result, for me the really important thing has been the way to get here, to write these words. Everything learned, everything shared and everything written. See you in the network of networks.